How do you view your garage today? Is it little more than the dusty, dark space you park your car or a disorganized storage room? Your garage has the potential to be so much more with the right floor system. Our epoxy garage floor installers in Nampa, Idaho can give you the perfect foundation for a bright home gym, clean garage workshop, or a cool man cave. Professionally installed garage epoxy can even improve your home’s value with a great return on investment. It’s hard to beat a garage epoxy coating when it comes to resilience, longevity, and design options. With a seamless and nonporous installation, your garage epoxy is nearly impervious to stains, abrasion, dents, peeling, and more. It can withstand hot tire pickup, road salt, and oil spills while lasting for 10-20 years with little care. Ready to see the potential in your garage? It’s time to give our garage floor epoxy contractors in Nampa a call. Don't be fooled; garage floor epoxy may look like paint when it's applied but it's not. It's an ultra-durable plastic material that's a result of resin and hardeners that react chemically and cure. When applied to properly prepared concrete, our high-grade epoxy solutions bond with the concrete itself to increase its tensile strength and weight capacity with a seamless surface that can resist all types of damage like hot tire pick up, abrasion, peeling, and stains. Want the ultimate in durability with an unbelievably vibrant color? Quartz garage floor epoxy is one of the most durable options you can choose. It goes beyond typical epoxy flooring with colored quartz granules that add texture and brilliant color as well as greater strength to your floor. Quartz is a common choice in demanding commercial applications but it also delivers a garage floor that lasts years. 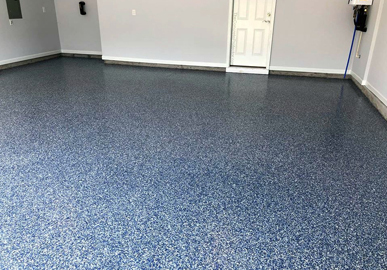 One of the most common decorative options homeowners choose for their garage is flake epoxy, which has a naturally slip-resistant texture and multi-colored pigments that lend the appearance of granite flooring. You can choose from a wide range of color options for your base coat with color flakes evenly broadcast over the surface for fun visual interest. 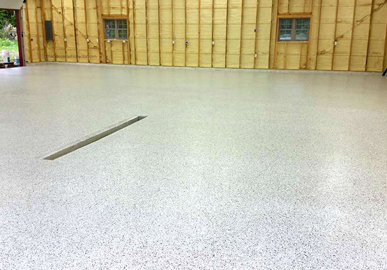 Nothing delivers the “wow” factor quite like a one-of-a-kind metallic epoxy garage floor. Metallic epoxy is created with metallic pigments that our epoxy garage floor installers agitate with blowers, solvents, and other tools to develop the perception of depth and movement. 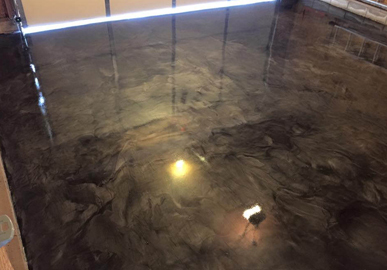 A metallic epoxy garage floor coating can look like rippling water, molten metal, marble stone, tanned leather, and more. Garage floor epoxy comes in a rainbow of colors from subtle neutral shades of black, white, and gray to eye-popping pinks, reds, greens, and blues. We can combine these colors to create custom patterns and designs or even 3D effects with metallic pigments. There’s no end to the design options possible with epoxy flooring. You don’t need to settle for solid colors or even broadcast color flakes with epoxy flooring. Our experienced epoxy garage floor installers in Nampa, ID can design custom epoxy floors with your choice of patterns, textures, and effects. From flowing shapes and stripes to pearlescent and metallic checkerboard and even sports team logos, we can do it all. You have probably seen DIY garage epoxy kits at your local big box store. While these kits can seem like a great investment, the results can never compare to professional garage floor epoxy. DIY epoxy kits have become all the rage thanks to their affordability and the ability to give your garage a brand-new floor over a weekend. Of course, you get what you pay for. Unfortunately, DIY epoxy kits are made with inferior 30-40% solids epoxy, not the 100% solids product you will get with our epoxy garage floor installers in Nampa, ID. We also prepare your concrete by repairing damage and using diamond grinding to thoroughly profile the surface and open the pores. These two factors make the difference between DIY garage floor epoxy that lasts a year or two and flawless professional results that can last up to 20 years. Professional garage floor epoxy is a true investment in your home and offers an excellent return on investment. Remember, you aren’t actually saving anything on a DIY kit considering it won’t last more than two years. 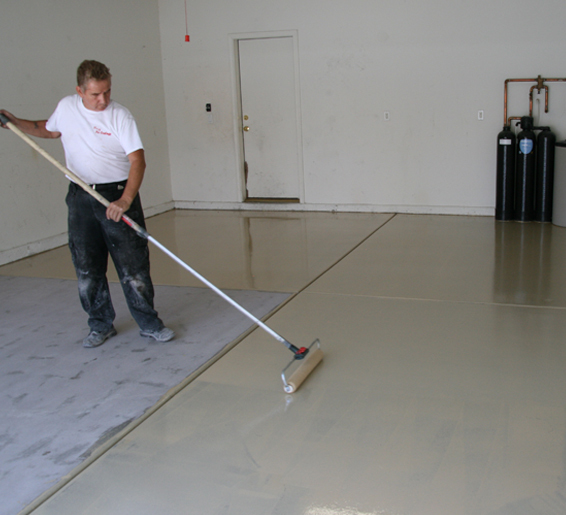 Our epoxy garage floor installers use only the best garage floor epoxy coating products with skilled concrete floor prep to ensure results that look and perform beautifully for many years to come.